Dried fruit, nut, seed and carob snack mix. 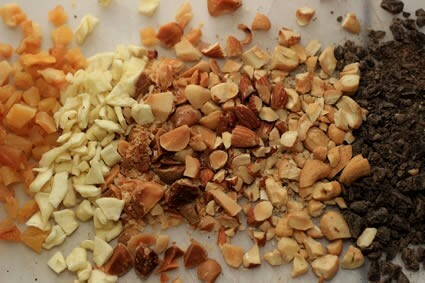 The combination of different nuts (plain, unsalted), seeds, dried fruit and carob make this a healthy snack filled with protein, vitamins and other nutrients. Chop up all the ingredients into small pieces. Pour into an airtight container and seal.